A few years have gone by since King of Kong: A Fistful of Quarters (2007) sparked a massive interest in the classic Nintendo arcade game Donkey Kong. In the years that followed, fans had been eagerly anticipating Billy Mitchell and Steve Wiebe going head-to-head in a live competition, and the recent Kong Off tournament at Richie Knucklez’ in New Jersey turned that into a reality. However, the game’s renewed popularity has resulted in many new contenders for the crown, as evidenced by Hank Chien’s recent world record score. The tournament featured many of the world’s top players battling it out over a two day period, and brought some fresh names into the spotlight. Two of these were Dean Saglio and Vincent Lemay, who up until that weekend were mainly known for competing on the emulated version of Donkey Kong through the MAME emulator. At the end of the weekend, it was Hank who came out on top, with several players closely behind. 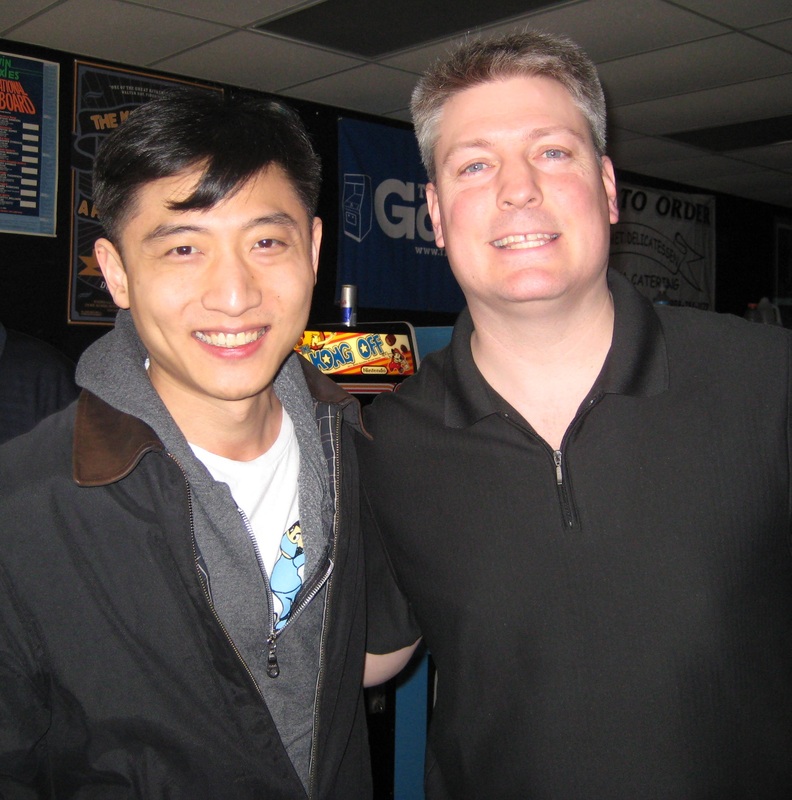 Steve Wiebe was inches away from the title, Eric Howard took third place and Dean and Vincent took fourth and fifth respectively. I talked to Hank about his victory, but also caught up with fellow top 5 players Steve, Dean, Vincent and Eric Howard, who was the first player in the competition to reach the kill screen. With Hank’s recent world record score, surely he felt some amount of pressure coming into the event. Is he generally cool under pressure, or did it affect his strategy? Hank: I think it works both ways. There is a little bit of pressure knowing that a lot of people consider you the favorite to win the event. You have nothing to gain and all to lose. At the same time, it’s a bit of a psychological advantage knowing that you’ve scored higher than any of your competitors. In general, I am pretty cool under pressure. I think I’ve demonstrated enough times now that I can play in public. However, I still prefer to play in the serenity of my own home. There’s enough pressure when you near the kill screen let alone having dozens of people watching you! How was this event, featuring ten other players, different for Steve? Steve: The experience was different than the other live attempts because I wasn’t the only focus and this took away the limelight, which I actually feed off when playing. I’ve had events where the crowd was cheering after each screen I cleared from the opening level. Don’t get me wrong, the crowd at the Kong Off was great and I enjoyed their support. On the other hand, not being center stage was less fatiguing, since the other players were also providing entertainment for the crowd and this lessened the pressure on me. I was surprised I was able to play basically 10 hours straight on Saturday and still felt pretty fresh on Sunday. With a MAME-score of 1,136,400 behind his name, did Dean Saglio feel any added pressure before the event started? Dean: I wouldn’t say that I had much pressure other than the personal expectations that I had for myself. 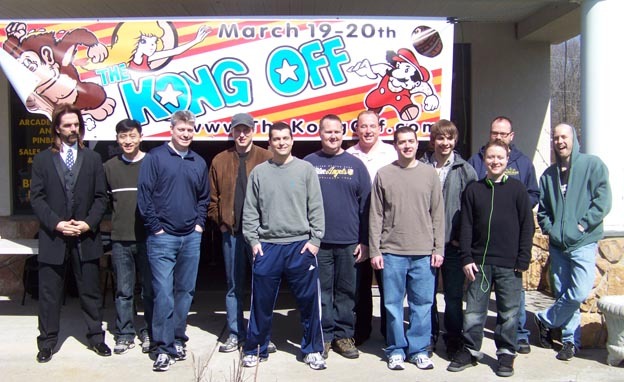 Most casual “King of Kong” fans do not know who I am and even the event organizers considered me to be a long shot for an arcade contest since most of my experience is with MAME. However, I considered myself to be the favorite to win. There were two reasons. First, I am capable of a scoring pace which very few of the other contestants can match. But more importantly, I felt fully prepared. Event winner Hank Chien graciously lent me a custom built arcade control panel which was adapted for use in MAME that I used for a few weeks leading up to the event and became fully comfortable with the controls. He knew that this might jeopardize his chances to win, but he wanted the chance to beat everyone’s best efforts. To me, that is great sportsmanship and the mark of a true champion. Congratulations Hank! Vincent Lemay from Canada had also recently been pushing his MAME score further and further. Where was he hoping that momentum was going to take him during the Kong Off? Vincent: I had three games over 1m, and recently got 1,050,200, so I knew that I could reach a very high score. Even on the arcade version, I knew I could get at least 1m even if playing with a keyboard is more familiar. In fact, point pressing at a 1.1m pace has become very familiar for me, so I knew that I could without a doubt try a 1m pace at the Kong Off. However, sometimes Kong doesn’t want you to get that 1m! 😉 It’s not just Kong’s fault that I didn’t reach 1m at the Kong Off though, it’s also my fault! 😉 I know that I can soon reach at least 1.1m on MAME, and maybe I’ll have an occasion to do the same on arcade… but I’ll always stay a MAME player! 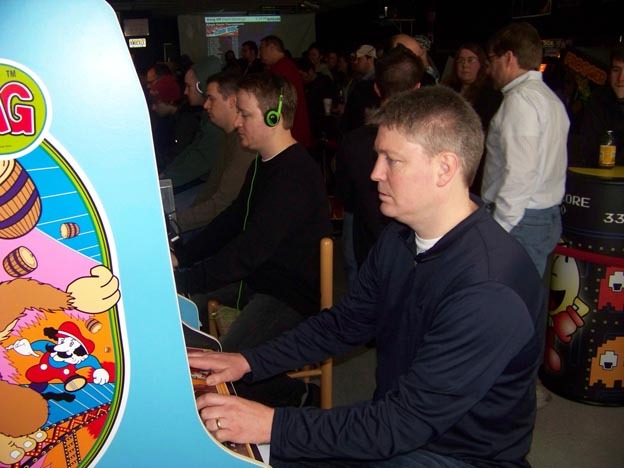 I had actually never played Donkey Kong live before, but I didn’t worry that much about playing LIVE at the Kong Off. However, I thought that I would have needed my iPod for the whole weekend, but I didn’t use it at all! Usually, when I play on MAME, I always listen to music while playing, but I decided to play without any music at the Kong Off as I wanted to hear what was going on around me. Luckily, the noises didn’t bother me at all. The first to hit the kill screen was Eric Howard, with a score of 941,800. How did it make him feel to grab the number one spot with that game, and where did he think it would take him? Eric: I had the top score for a little while. I felt on top of the world even when I was pushed to second place. I wasn’t an established name for a lot of people, so it was great to make a mark like that! I called it out the night before and had practiced to do exactly what I did. To be honest though, I didn’t practice very much because you can burn yourself out and I made sure that didn’t happen. I thought it was going to be a second place score, third at the least. I could have sacrificed my extra man, but I thought it would be cool to have an extra and not even kill him off. The deciding factor was the fans, as I had tons of people behind me and it was our moment. Richie said to put on a show for the fans so I did. At the end of the weekend, the world record stayed out of reach. What factors played a role there? Hank: Actually Dean played one game to 912K at a very high pace. I’m not sure if it would have been a world record if he finished it, but it was in the same ballpark. The problem is the goal was to beat the current leader, not to break the world record. In a limited time competition, I think everyone scaled back at least a little bit. Dean’s score was the only one in the top 5 to not reach a kill screen. What was that game like? Dean: My best game of the event of over 912,000 began at around 7:30 pm on Day 1 after a long and tiring day of playing. I had just spent over an hour trying to get a game started and was running into a lot of early deaths and game restarts, which becomes more and more frustrating in a limited timeframe event. For a while, I had decided to just “skip” the point pressing of the early levels and “race to level 5” to start my game with a low score, but even that wasn’t working! So, all of a sudden out of frustration I had the opposite reaction. I decided to play for the World Record. I felt very lucky to get a game going with such a great pace. I was more than half way through the game on my second man and was still looking at scoring over 1.1 million. Just as I was thinking about whether or not it was wise to continue along at this pace, I lost my second and third men very quickly on L=13 and L=14. The third death was one that beginners often experience — I hit the jump button a frame too early and it did not register and a barrel rolled right into me. I never make that mistake any more so it was quite distressing. Now, down to my last man, beginning at the beginning of L=15 I decided to switch to a basic top-hammer-only barrel strategy and eliminate a lot of risk. So, instead of around 57,000 point levels I was now settling for maybe 47,000 point levels. At around L=17 the live radio broadcast was now booming over a giant microphone and inciting the crowd so I began turning my iPod WAY up to try to drown out the added distraction. On Level 19-3 something slightly unexpected happened while approaching the top hammer and I just had a brain cramp and did not handle the situation correctly — I landed on a barrel and died, ending my game and seemingly my chance to win the event. With a score of over 912,000 on 19-3, I still had 15 1/2 more screens to go, which likely would have yielded another 125,000 points or so with this strategy. If this game had reached a kill screen, it would have ended up at between 1,030,000 and 1,040,000 points, which would have been tough to beat. How does setting a good score early on change your gameplay style? Eric: I only had one hour of sleep so I knew I had to get a good score out the gate. Whenever I play during a weekend and I don’t put up a good score until the last day, it ruins my weekend. This happened to me when I was a 200k-400k player. I wanted to enjoy this event and I will remember this for the rest of my life. After I played this game, a couple restarts, and one other real attempt, I tried for some bounties and just enjoyed the day. I cheered others on. I got to sign autographs and hang out with fans. I spent a lot of time hanging out with Billy ‘The Man’ Mitchell and Ben Gold. At night my girl Christine my buddy Scott Doyle and I grabbed some beers and partied; it was awesome! In the later stages of day 2, Steve Wiebe took the lead. What was going through Hank’s mind as he chased that score? Hank: I was actually very happy for Steve because I knew he had a run of bad luck on Day 1 and his prior scores did not represent his skill level. He was also making me look bad as I predicted him to win! I was probably around 700 or 800K when Steve’s score was announced. I was on pace for a score over a million with a comfortable margin. I calculated my score if I played it safely for the rest of the game and it was about 1M even. Between losing the lead, the nervousness of nearing the end of a long game, and having a large crowd watching you, I decided to play it safely. Even then, I felt I was losing points all over the place. Fortunately, I was able to fight off the nerves until the kill screen and retake the lead, but I was just shy of a million. At that point, Steve had left to catch his plane home. How did he found out about Hank’s winning score? Steve: I was walking by the players on my way out and wanted to say my goodbyes, but they were all really focused, so I didn’t bother them. I noticed Hank was at about 900K on his last man, and I sensed he was going to take the top spot. I left about 10 minutes before his game ended and I spoke to Richie Knucklez on the phone before my plane took off. He told me Hank’s score and I asked to speak to Hank to congratulate him. I was happy for Hank and it was best for the event that the winner could be there for the closing ceremonies. With his very last game, Vincent broke into the top 5; what was that experience like? Vincent: First of all, I’m still very happy about being in the top 5. However, everyone could have gotten in the top 5, and everyone could have won the event. On Saturday, I finished the day in fifth place, and I also ended the tournament on Sunday in fifth place, so that was pretty cool. However, before my last game, I was a little bit upset/frustrated, because I didn’t do the scores I wanted to do (because I wanted to do a 1m game at the Kong Off, like everyone!). I had a lot of good games on a 1m pace (like my 742k, 706k and 596k games), but I couldn’t reach the end. So, on Sunday, on my first game, I tried a no-point pressing game on my first try, and I did 636k. Still a good score, but I wanted to reach a kill screen at least. And, on my last game of the tournament, I retried a no-point pressing game with the desire to get AT LEAST a kill screen at the Kong Off. I was upset, but I got through that last game of the weekend and reached the kill screen! I was very happy, even though I would have wanted more. It was very important to me to set a GOOD highscore, because I wanted to make a good impression. I wanted people to know that I’m not only good on MAME, but also on arcade. And, in two days, I did 10 games, with an average of 550k, and I know that I had one of the best averages of the competition. So I’m very happy with that and it was also very cool to have Billy Mitchell witness the last stage of my kill screen. And also, there were a bunch of people watching my kill screen game, so I really enjoyed it! Even with Billy by my side, I didn’t really feel any pressure from all those people watching me play. Be sure to check out part 2 of this interview for more Kong Off coverage.